Christmas is just around the corner, and young and old are thinking of only one thing: PRESENTS! What am I going to get? What am I going to give? Pretty much in that order. I won’t pretend that I remember all my gifts, but when Vicki mentioned her train, I recalled what I received for Christmas that year: a Kodak Brownie Hawkeye camera. I used it to take photos of her and Dad playing with the train and another of Dad alone, in hat and overcoat, postponing his drive to his law office to sit on the floor and play with Vicki’s train. I’m surprised Ray doesn’t remember more of his presents because – beginning at age 9 – he developed a habit of surreptitiously opening his gifts when his parents were at work. He played with them, then rewrapped them with no one the wiser … which is likely the reason he is now so proficient at wrapping packages. Had I not been so anxious to see what was inside, I might have read the card which was inscribed “To My Honey.” Only when I saw men’s pajamas did I realize the gift was for Dad. 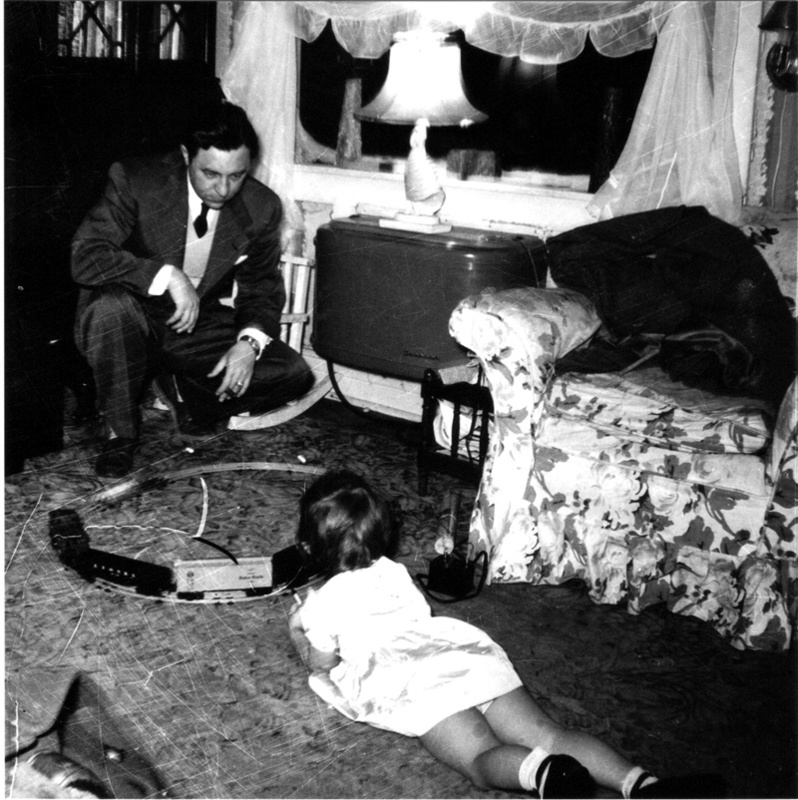 Jest for Grins columnist Marsha Goff shot this photo of her kid sister Vicki playing with her new train using the Kodak Brownie Hawkeye camera that she got for Christmas in 1952. The girls' father, Lew Henry, looks on in his hat and overcoat, postponing his drive to his law office to watch Vicki play. What Grams, who had managed a scrap yard with Grandpa for decades, should have said was, “It’s metal,” but the word “junk” was enough for Mom to guess silverware. Rats! I still remember the gift Dad and I bought for Mom when I was a child: a pair of backless, high-heeled, ice blue satin bedroom slippers. I was proud to select my favorite color, overlooking the fact that my mother didn’t care for blue. But I’ll never forget how glamorous she looked when she vacuumed the carpet or made our breakfast wearing those slippers. The threat proved untrue, and Ray still has the shotgun, although I’m not sure he’s ever shot it. But Ray’s shotgun demonstrates that sometimes what you want is more important than what you need. That is why we once gave a motorcycle to Ray Jr. and a huge Burmese python to Greg. When it comes to Christmas presents, the best gifts are the love and laughter of family and friends and – because God blessed us with the gift of memory – we’ll also have the love and laughter of those who are no longer with us … those precious ghosts of past Christmases. That’s all we really need. This year, I wish you the gift of appreciating the things that really matter. Merry Christmas!